Pumpkin Pi project for Halloween @Raspberry_Pi #PiDay #RaspberryPi #ElectronicHalloween « Adafruit Industries – Makers, hackers, artists, designers and engineers! Here’s an Electronic Halloween themed throwback to this great project write-up from Drew Fustini on the element14 forums. 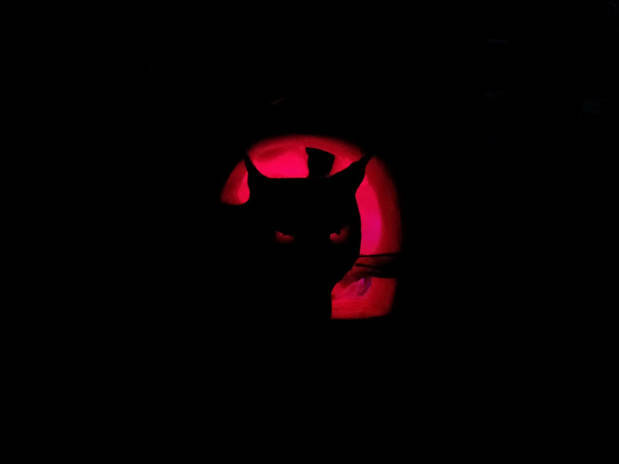 Thanks very much to my colleague Liz Houtz for letting me use her nicely carved cat-o’-latern. I lined the inside of the pumpkin with a gallon ziplock bag to keep the gear from getting too messy. The power and Ethernet cable went through the carving of the cat’s tail on the backside.